Another data breached of this month and may this year can be called as Data Breached year. This time Russia's biggest social networking site VK.com is in the line of historical breached. The leaked database contains information like full names of users, email addresses, plain-text passwords, location information, and phone numbers. The hacked database is selling by same hacker named Peace, who have sold the dump data of LinkedIn, MySpace, Tumblr etc. All the database were sold on Dark web and again Vk.com database were on sell for 1 BTC i.e. $580 approx. 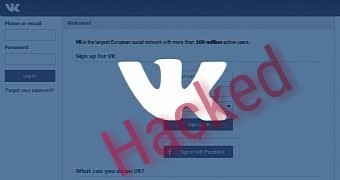 Hackers says that all the passwords of VK.com were in plaintext when its was hacked. Its is being says the data have been stolen in late-2012 or early 2013 when VK.com had just under 190 Million users. This leaked data were first reported by leakedsource which have got the portion of database. Company VK.com have already analyzed the content of dump database. LeakedSource mentioned that the most common passwords used by VK users were 123456, QWERTY, 123123 etc, and all these were very easy to guess. We again recommending our users to change there online accounts passwords and also to follow strong password practices. Don't use same passwords for there accounts and change them in a regular basis.